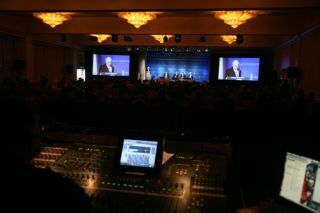 WorldStage provided audio, video, lighting and logistical support for the Milken Institute’s 2012 Global Conference at the Beverly Hilton Hotel in Los Angeles. The annual Milken Institute Global Conference assembles some of the world’s most extraordinary people from business, finance, policy, education, health, energy and philanthropy to explore solutions to today’s most pressing challenges. Participants include top CEOs, senior foreign and U.S. government officials, academics, leading journalists and noted figures in the world’s capital markets. This year, speakers included former president Bill Clinton, Governor Jerry Brown, Michael Milken, Steve Forbes, George Lucas and T. Boone Pickens. With the hotel filled to capacity and breakout rooms, multiple ballrooms and outdoor pavilions to support over four days of a packed schedule, WorldStage employed a workforce in excess of 120 technicians. WorldStage provided a much larger complement of project management on site than normal with four PM’s, three EIC’s, an equipment manager and a labor coordinator on site at all times. In all, twenty-six cameras were required, twelve of them HD. “To maximize space, we mounted a pair of robo cameras in each of the breakout rooms and ran wires to an adjacent room where the video operator recorded the presentations,” Bevan explained. The Milken Foundation Creative Services Department, which produced the event, furnished all the computers for the Global Conference. Josh Lesser of Vision Matrix was the Producer of the event and Larry Lesser, the EVP of The Milken Family Foundation Creative Services Department, was the Executive Producer.